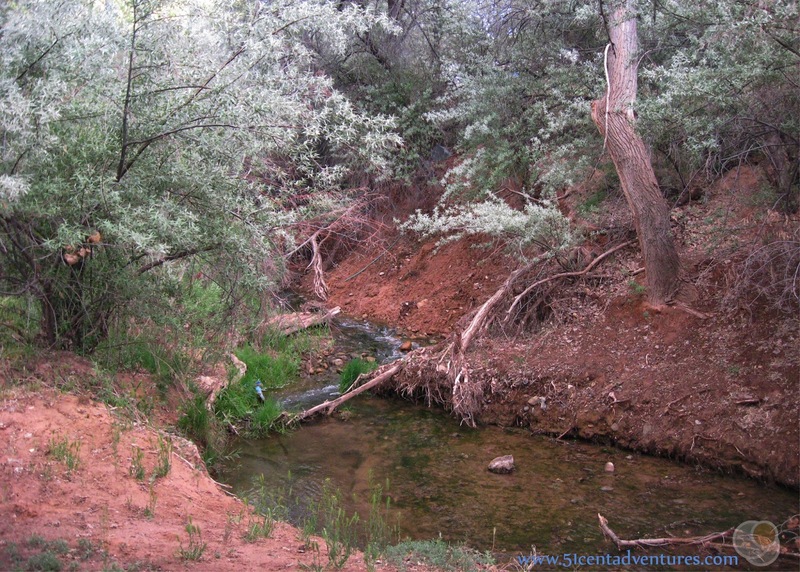 Description: Leafy trees, green grass, and a small creek make this campground in Moab, Utah a slice of paradise. Location: 1520 Murphy Lane in Moab, Utah. 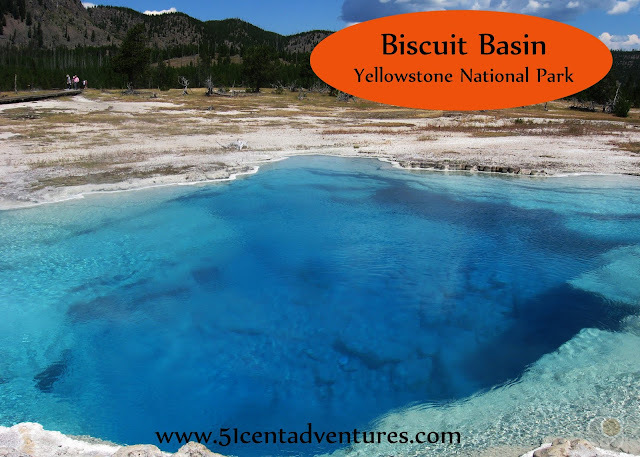 It is located about three miles south of town. This was the sixth and last stop of the fifth day of our Southern Utah Road Trip that my husband and I went on for our anniversary in May of 2010. We left Newspaper Rock and drove north for 50 more miles to Moab, Utah. 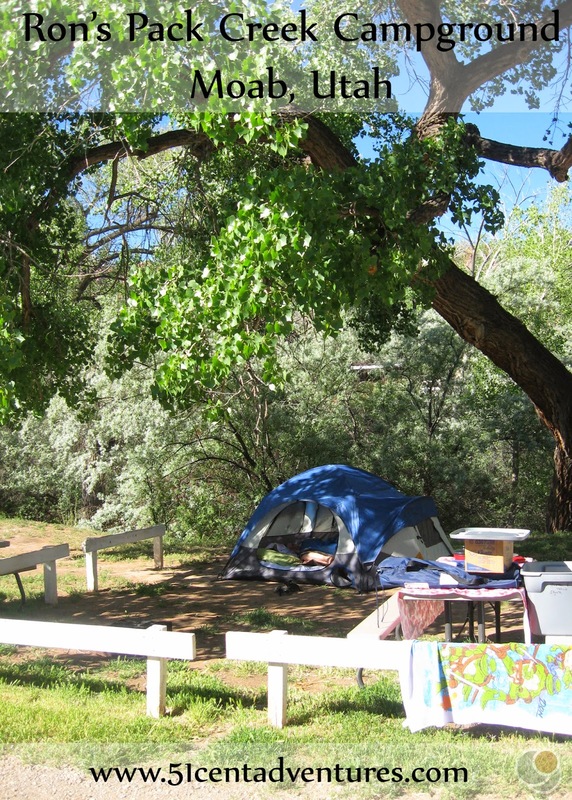 Ron's Pack Creek Campground is located at the southern end of town. After driving 230 miles in one day I was very glad that we didn't have to drive through Moab to get to our destination. When I started planning this trip I thought that we would spend this night at the Devil's Garden Campground in Arches National Park. However, I realized that I didn't want to stay at that campground until the following night. 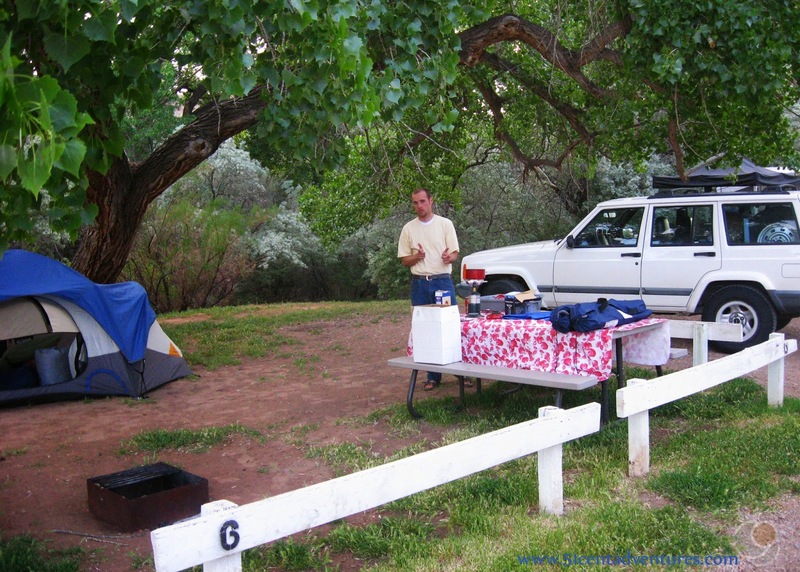 Devil's Garden Campground is located about 18 miles inside of Arches National Park. We were planning on visiting other sights in the area, and I didn't want to have to drive into and out of the park more often than we needed to. I decided to change the plan so that this night we stayed in a campground in Moab, and then stayed at Devil's Garden the next night. 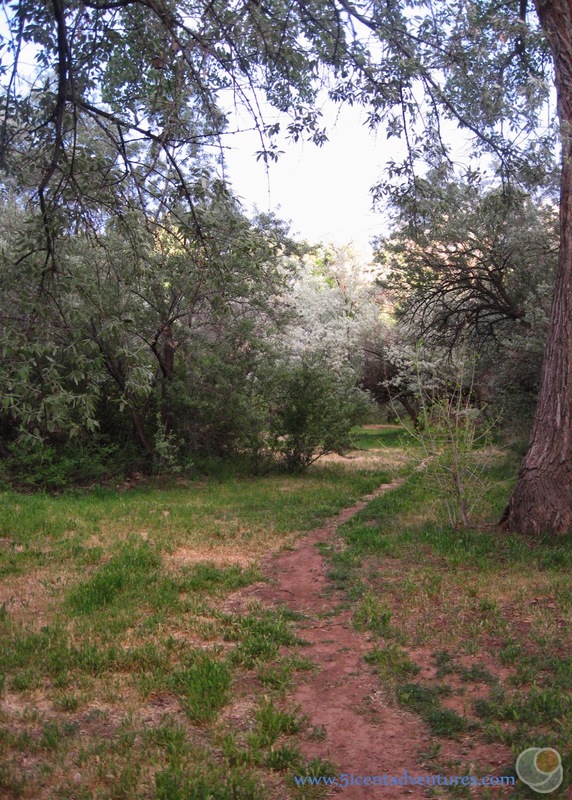 I found Ron's Pack Creek Campground through an online search for campgrounds near Moab. 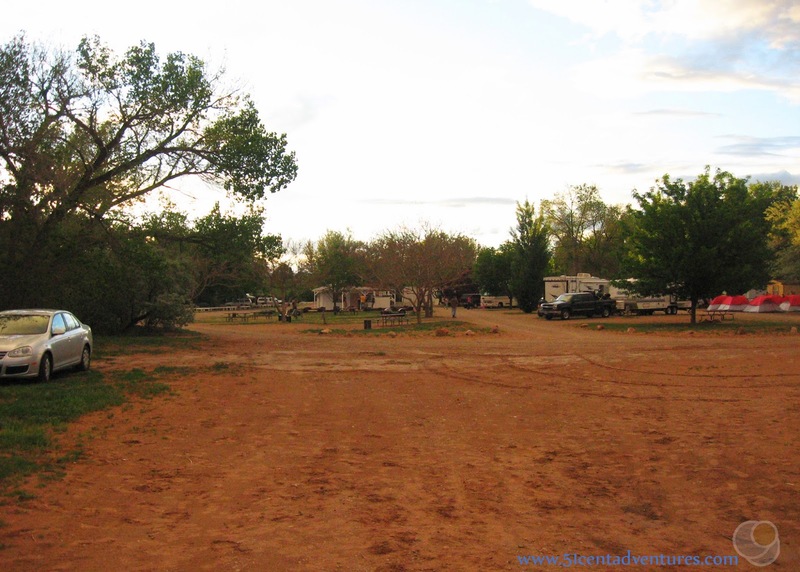 It bills itself as "the only off-highway multi-site campground in the Moab area." I liked the idea of staying somewhere that wasn't right next to Highway 191. I also liked the pictures on the website. They showed grassy campgrounds shaded by large trees. Overall it looked like a nice place to stay so I reserved one night at the campsite. When we arrived at the campground I felt like we'd just been transported to heaven. It was certainly much better than the dusty campground at Goblin Valley where we had camped the previous night. Large trees lined the whole campground. Grass grew in the campsites. Our campsite was even next to Pack Creek. After a whole day of driving in the desert this was paradise. We quickly discovered that this place was the most laid back campground EVER. We never even met the Ron of Ron's Pack Creek Campground - or any of the staff for that matter. We never checked in or anything. Some other campers told us to just find a spot and make ourselves at home. I guess the campground is located far enough off the highway that the only people who show up have reservations, and so have already paid. I know that I never would have found this place without the directions that were provided on the website. We had a quick dinner and then went to explore the campground. We were on the edge of the Pack Creek so we checked that out. There is a nature trail that runs along the creek so we took a stroll on that. We noticed that one of the group sites is located on the other side of the creek. If I was staying at this park with more than just my immediate family I would love to stay at that site. I think it is called the Across Stream Group Site. Traveling through the desert made me appreciate how important an oasis like this place can be. 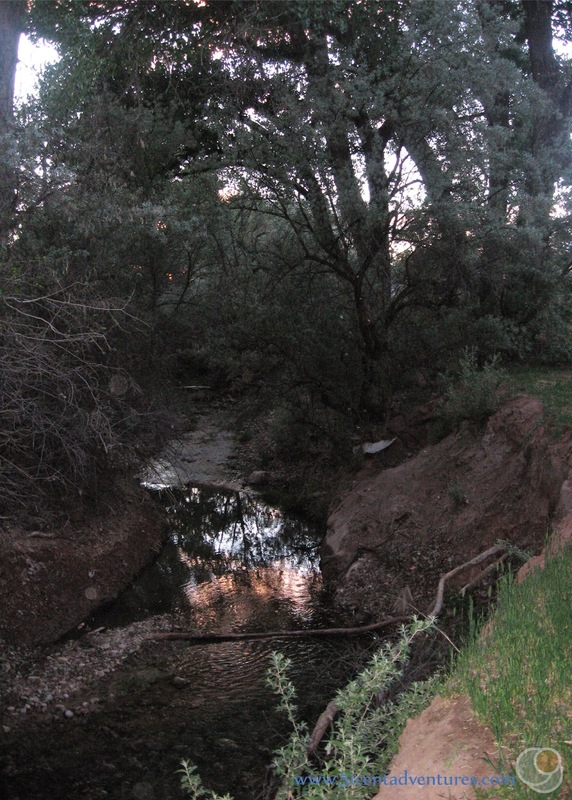 This small creek provided so much life to the area. The back of the campground is a large field used for overflow parking and extra large groups. I loved how the green trees contrasted with the red cliffs in the distance. This is a look back at the main part of the campground. There are many sites for tents, and RVs. There are several group sites. The middle of the campground has a covered pavilion with many picnic tables. There is a bathroom with hot and cold running water and showers. Our last showers had been two days ago at Ruby's Inn outside of Bryce Canyon so we were very happy to have a chance to get clean again. There is a small laundry room attached to the bathrooms. The laundry rooms has coin operated washers and dryers. 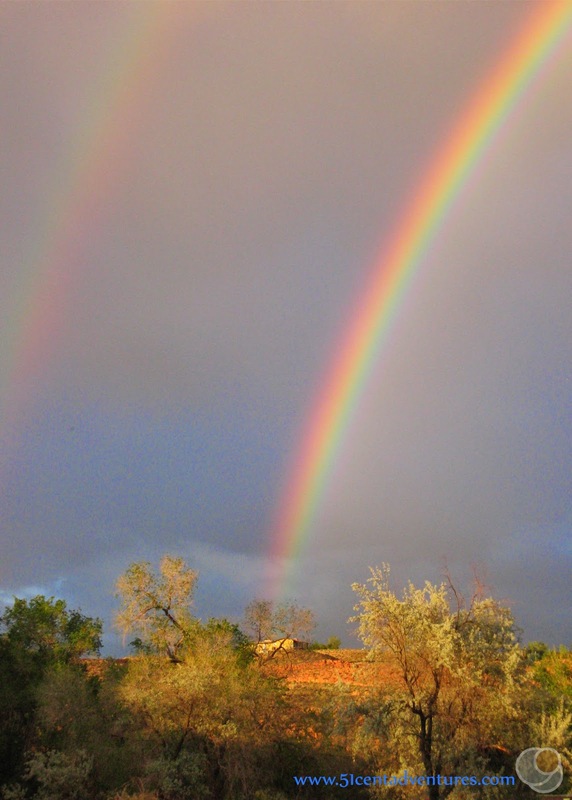 While we were on our walk we saw a gorgeous double rainbow. That rainbow confirmed my thoughts that we had found paradise. We slept well during the night. Some campers stayed up talking, but they quieted down before it got too late. I was very sad to leave this campground the next morning. I wished that I'd reserved an extra night here instead of the Devil's Garden Campground in Arches National Park. Even now, almost five years later, I still feel dreamy when I remember our stay at the Pack Creek Campground. Recommendation: I highly recommend Ron's Pack Creek Campground to anyone who needs somewhere to camp in Moab. The rates can't be beat, and the location is heavenly. Directions: You'll want to make sure you have the directions if you want to stay at this campground. It is located away from Main Street so it's not like you'll just happen to see it. Drive on Highway 191 to Spanish Trail Road. (There’s a Shell service station at the corner.) Turn onto Spanish Trail Road. At the top of the hill at the traffic circle, turn left onto Murphy Lane. Travel 1.4 miles and then turn left onto Murphy Lane. The campground is located behind Pack Creek Mobile Estates. You'll have to turn down the road that leads to the mobile home park and then keep going a few more yards to get to the campground. This is really good to know. 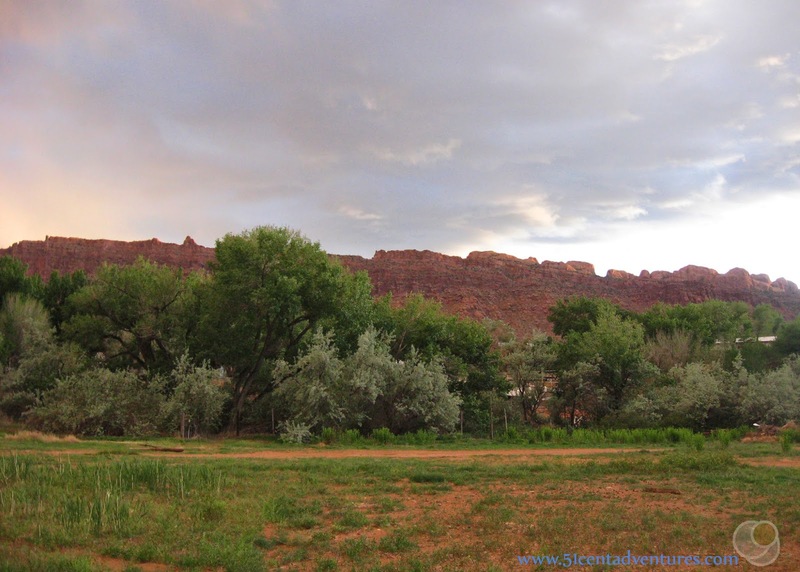 I love the Moab area, but have never been very fond of any of the campsites I've stayed at!